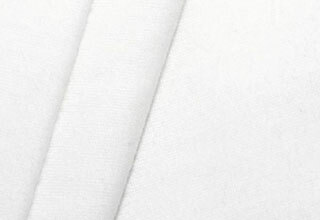 Molleton Decatising Wrappers in Cotton or special Cotton–synthetic blend for decatising special carded woollen goods, for example heavy weight fabrics for coats or gabardine fabric. Creates a volumised, dull and soft finish under standard or low wrapper tension, and low temperature. With higher wrapper tension and moderate temperature a harder but still dull finish can be achieved. The heavy weight of the wrapper is not pulled in when processing heavy weight fabrics and also compensates for end marks when processing these types of fabric.